Most of the people depend on Google document to create documents files. Spreadsheet is also one of the most used product in Google documents, till now Google Spreadsheet don’t have Spell Check feature in it. But now onwards users can spell check on Google Spreadsheet with inbuilt spell checker tool. Google yesterday announced in it’s official Google document blog about this spell checker tool in Google spreadsheet. One funny thing what I found in that post is, Google (writer of that post) has made lot of spell mistake! in that post. Some users also commented about this issue on that post, but seems no one is looking into it. Anyway come to the point now. 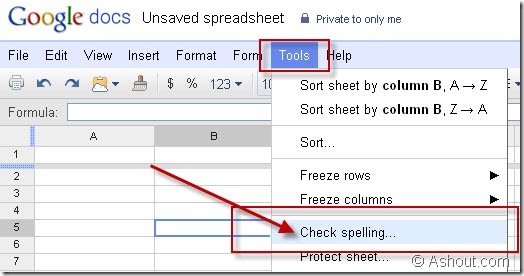 To check spelling in Google Spreadsheet just navigate to Tools >> and click Check Spelling… option which is available there. It will automatically go through all the cells on your sheet,and if they found any spelling mistake on any cell, then it will highlight in Red Color. To correct that spell mistake, click on that wrong spell and a list of spell suggestion will display in drop done menu and select proper spelling. In official announcement they said, the ability to add words to your own dictionary is also coming. For those who are waited for spell checker tool in Spreadsheet now they can get it.